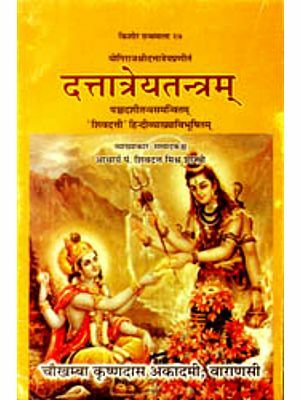 This book presents the multi-faceted Hindu deity Dattatreya from his Puranic emergence up to modern times. 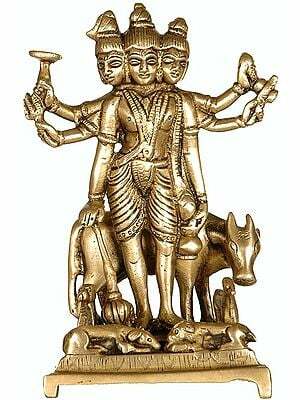 Dattatreya's Brahmanical portrayal, as well as his even more archaic characterization as a Tantric antinomian figure, combines both Vaisnava and Saiva motifs. Over the course of time, Dattatreya has come to embody the roles of the immortal guru, yogin and avatara in a paradigmatic manner. 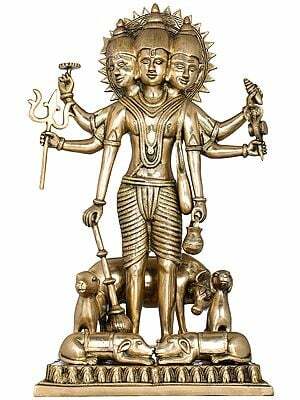 From the sixteenth century Dattatreya's glorious characterization emerged as the incarnation of the trimurti to Brahma, Visnu, and Siva. Although Maharastra is the heartland of Dattatreya devotion, his presence is attested to throughout India and extends beyond the boundaries of Hinduism, being met with in Sufi circles and even in Buddhism and Jainism via Nathism. The scare attention which most Western scholars of Indian religions have paid to this deity contrasts with its ubiquitousness and social and religious strata of Indian society; among his adepts we find yogis, Brahmans, faqirs, Devi worshippers, untouchables, thieves, and prostitutes. This book explores all primary religious dimensions: myth, doctrine, ritual, philosophy, mysticism, and iconography. 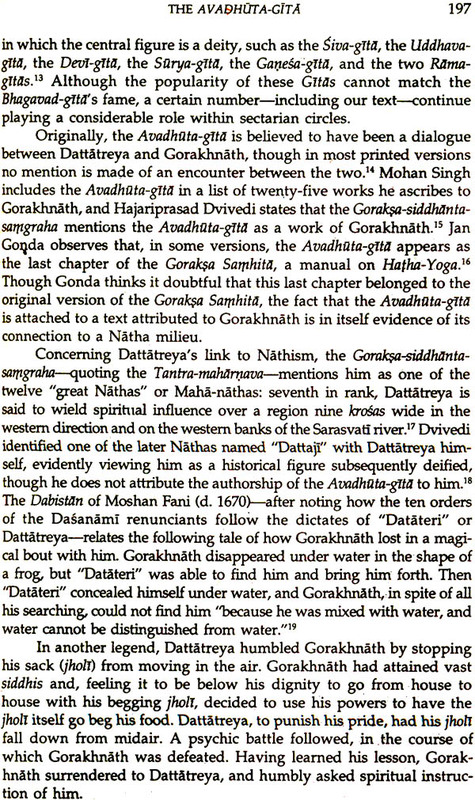 The comprehensive result offers a rich fresco of Hindu religion as well as an understanding of Marathi integrative spirituality: precisely this complexity of themes constitutes Dattatreya's uniqueness. Antonio Rigopoulos is the author of The Life and Teachings of Sai Baba of Shirdi, also published by SUNY Press. 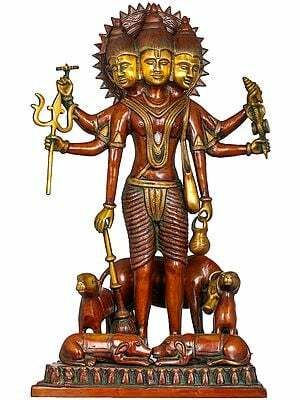 This study presents the main phases in the making of the Hindu deity Dattatreya, from its Puranic emergence as an immortal Guru, Yogin, and Avatara, up to its celebration as the trimurti of Brahma, Visnu and Siva. Focusing on the origin and development of this particular deity, one is brought into touch with virtually all major religious strands of that complex network of religions called Hinduism. 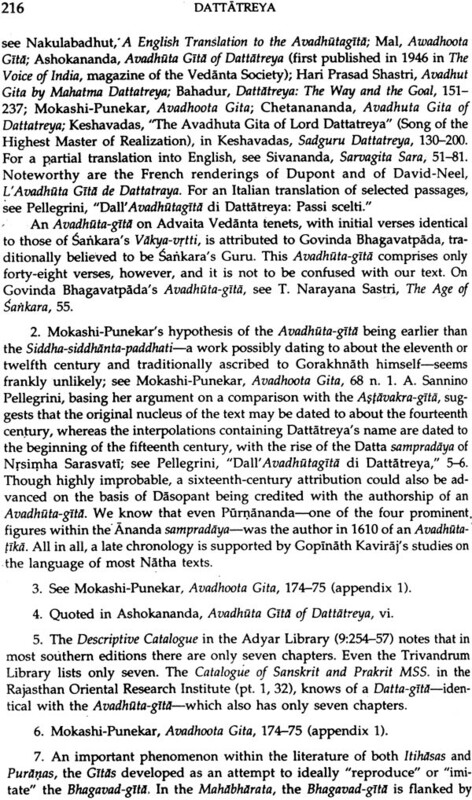 Its assimilative force is witnessed by the variety of communities which appropriated Dattatreya from within an overall nondual philosophical framework: from the world of antinomian Tantrism to the world of Brahminical ritual orthodoxy, passing through the renunciatory milieux of Yoga, the Mahanubhava sect, Vaisnava devotionalism, Saiva asceticism, Saktism and Devi worship. Although one might envision the presence of plural Dattatreyas, construed in different ways within each given community, I would rather opt for the existence of a single multifac- eted deity, constantly absorbing new traits in an ongoing process of cross-fertilization. Significantly, Dattatreya's catalyzing force extends beyond the boundaries of Hinduism, also being linked to popular Sufism and Jainism.
. 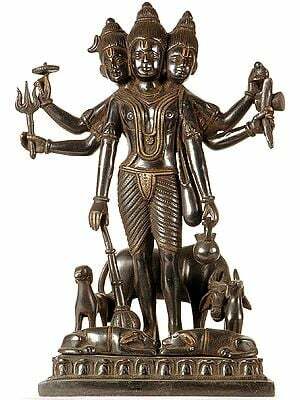 Following the ascendance of Dattatreya to the top of the Marathi pantheon-truly a triumphant vijaya-affords a recognition of the synthetic spirituality which this deity inspired and attracted. It also illustrates the Maharashtrian reworking of religious influences from both the north and the south of India, as well as the synthesizing of Saiva and Vaisvava motifs. 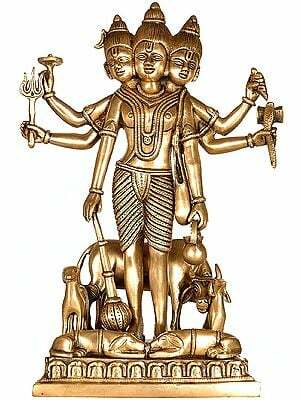 Although Maharashtra is the heartland of Dattatreya devotion, his presence is attested to throughout the In- dian subcontinent, especially in southern States such as Karnataka, Andhra Pradesh, Kerala, and Tarnilnadu, but also in Gujarat and even in Nepal. The adaptation and assimilation of a "lord of Yoga" exhibiting Tantric, antinomian traits, into the more sanitized and bhakti-oriented views of the Puranas is of special relevance. The basic relationship between Tantra and Purana is of great importance for understanding medieval Indian spirituality. 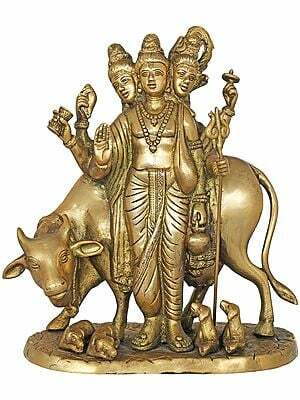 Dattatreya's presence in both types of canons makes him a case study for understanding this complex link. Furthermore, the unfolding of the Dattatreya icon illustrates the de- velopment of Yoga as a synthetic and inclusive body of ideologies and practices. Although fundamentally a jnana-murti, Dattatreya is a "honey bee" Yogin: onewhose character and teachings are developed by gathering varieties of Yoga's flowers. 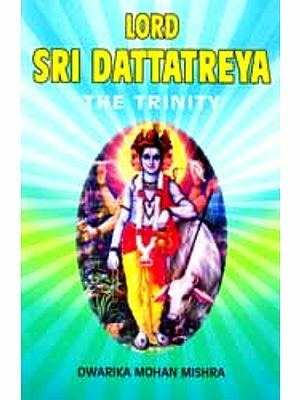 For all religious groups whose propensity it is to include ideas, practices, and teachings from the ocean of traditions, Dattatreya is truly a paradigm. The scarce attention paid to this remarkable figure by most Western scholars of Indian religions contrasts sharply with the deity's ubiquitous presence and social permeability. 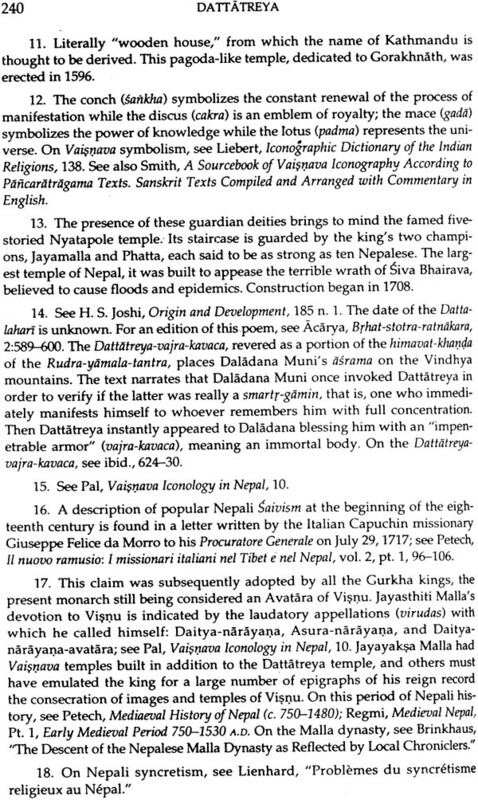 The only three scholarly monographs on Dattatreya are the following: Sri Jaya Chamarajendra Wadiyar Bahadur, Dattatreya: The Way and the Goal (London: George Allen & Unwin, 1957; reprint, Delhi: Motilal Banarsidass, 1982); R. C. Dhere, Datta Sampradayaca Itihasa (2d ed. Pune: Nilakanth Prakashan, 1964; 1st ed. 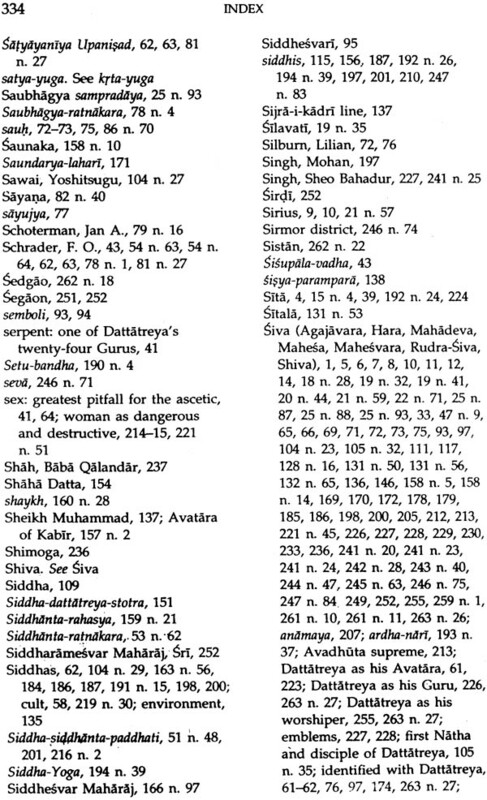 1958); Hariprasad Shivprasad Joshi, Origin and Develop- ment of Dattatreya Worship in India (Baroda: Maharaja Sayajirao Uni- versity of Baroda Press, 1965). 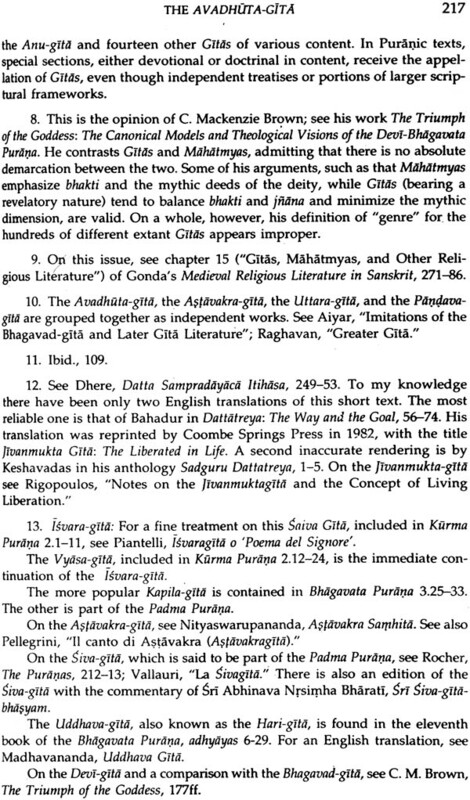 For its wealth of information on the Dattatreya movement and its cult-centers, mention must also be made of P. N. Joshi, Sri-dattatreya-jnan-kos (Bombay: Surekha Prakashan, 1974). 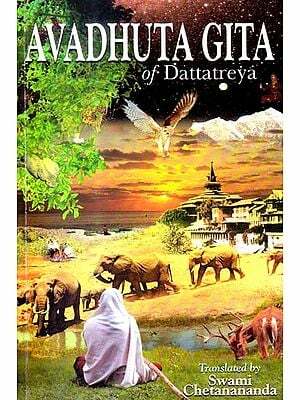 Devotion to Dattatreya cuts through the social and religious strata of Indian society: among his adepts one finds Brahmins, Muslims, untouchables, Mahanubhavas, Yogins, thieves, philosophers, prosti- tutes, ascetics, and so forth. There appears to be no religious milieu, at least in Maharashtra, in which Dattatreya is not in some way or other involved. 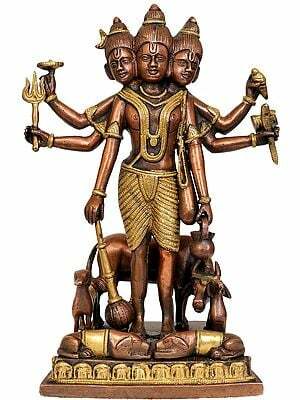 Through the study of this single murti, one is offered a rich fresco of Hindu religion as well as an appreciation of Marathi integrative spirituality: precisely this richness and complexity of themes constitute Dattatreya's distinctive mark. Adopting a contextualized approach, this study is inevitably concerned with all primary religious dimensions: myth, doctrine, ritual, philosophy, mysticism, and ico- nography. Its aims are to provide the following: (1) an introductory yet comprehensive monograph of a rather neglected Hindu god (2) an analysis of the. 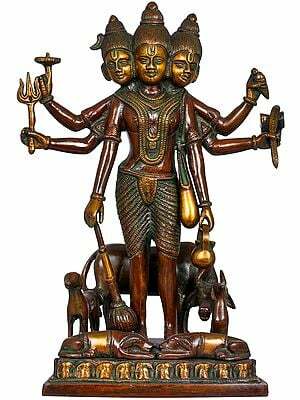 amalgam of religious motifs which have contributed to the molding of this exemplary Maharashtrian deity, and (3) a repre- sentative case, useful for comparative work with other Hindu gods. 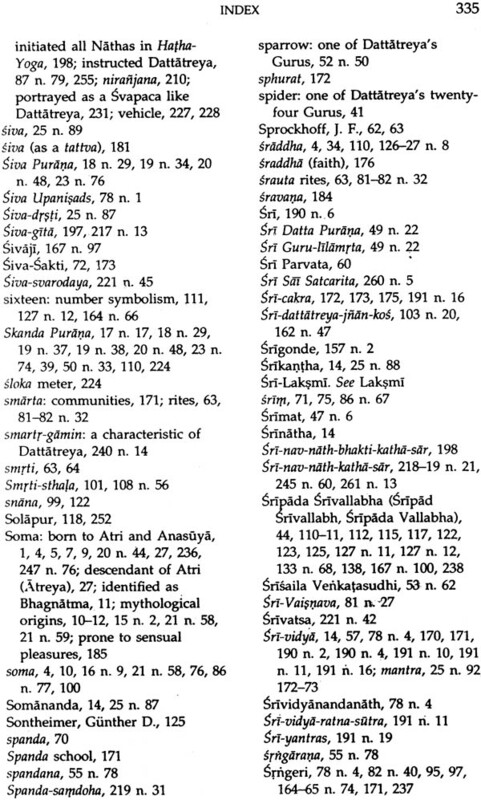 In an attempt to present not the history of the Dattatreya icon but rather some of the crucial phases in the deity's unfolding, chapter 1 begins by offering a sketch of Dattatreya's genealogy and Puranic birth, focusing on the Vedic mythical antecedents of his "parents," Atri and Anasuya, and "brothers," Soma and Durvasas. 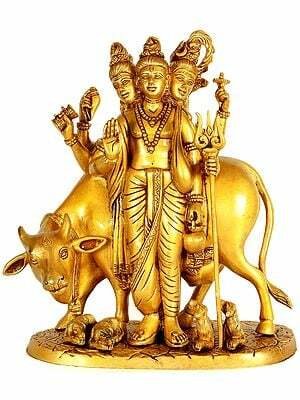 Chapter 2 treats the Epic and Puranic mythology of Dattatreya, his foremost legendary feats and their variants. 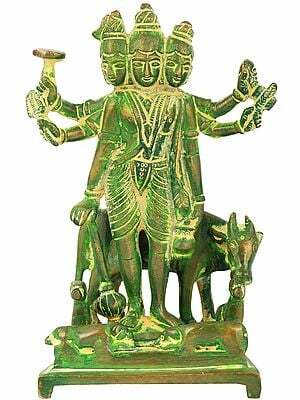 Though subsequently identified as an Avatara of Visnu, Dattatreya first emerged in the Mahabharata as a powerful Rsi granting boons, notably a thousand arms to Arjuna Kartavirya. In Puranic literature, particularly in the Markandeya Purana, he is depicted as a master of Yoga tinged with Tantrism, teaching his art to his pupil Alarka. 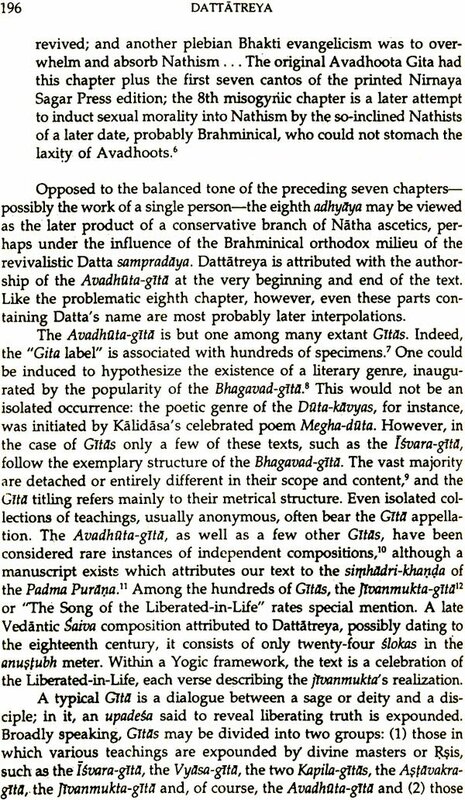 These seminal Epic and Puranic themes, in which both heterodox and orthodox Brahminical discourses are discernable, determine Dattatreya's synthetic personal- ity. Subsequent sampradayas and religious literature will enlarge upon these narratives, recreating the basic myths in a variety of ways. 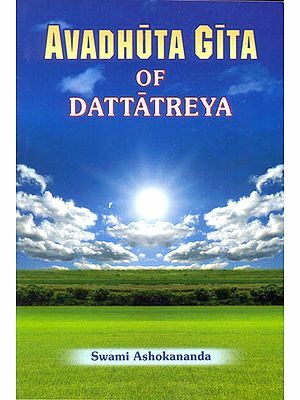 Chapter 3 is devoted to Dattatreya's place in late sectarian Upanisads-probably reflecting older traditions and beliefs-in which he is often mentioned in the role of Yoga teacher, identified as the archetypal Avadhuta or Paramahamsa ascetic. 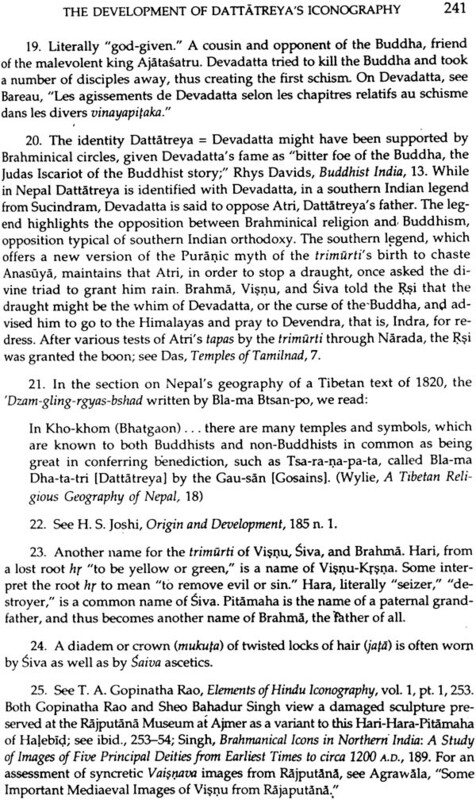 These Upanisads are important crossover texts bridging Yoga traditions as well as estab- lishing the Vaidika/Tantrika connection.